- Publisher The Discovery God Series follows the adventures of a young bear named Bailey and his many questions about God. Through thought-provoking stories, children will learn valuable lessons about the character of our loving Creator. About "When Was God Born? (Discovering God Series)"
The Discovery God Series follows the adventures of a young bear named Bailey and his many questions about God. 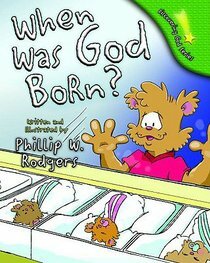 Through thought-provoking stories, children will learn valuable lessons about the character of our loving Creator. Phillip W. Rodgers resides in Ringgold, GA, with his wife, Stephanie, and their two girls, Kaylee and Abby. He serves as the product acquisition and creative director for National Center for Youth Issues. Whenever possible, he appears at churches or youth organizations sharing stories, thought-provoking conversation, and an almost infamous art lesson, all of which teach children how they too can "discover God." Phillip also speaks at youth events as well as other venues.